I love a good mystery... don't you? Well here's an interesting one. I recently landed a project watch and assumed it was a 1959 Dexter. 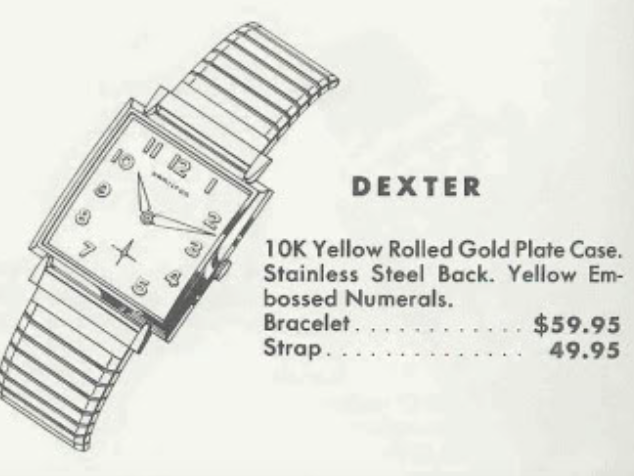 This version of the Dexter is uncommon and was only produced for two years. The Dexter has a 10K RGP bezel with a stainless steel back. The dial has yellow embossed numerals, no markers. My project watch looks just like the Dexter but it came a on different, but period-correct bracelet. As you can see in the photo below, the bracelet has textured panels that echoes the interesting pattern of the textured dial of the watch. After I completed my project and was putting the dial back on, I was struck with the thought that the dial really reminded me of a Romanesque dial - but those dials typically have black markers. 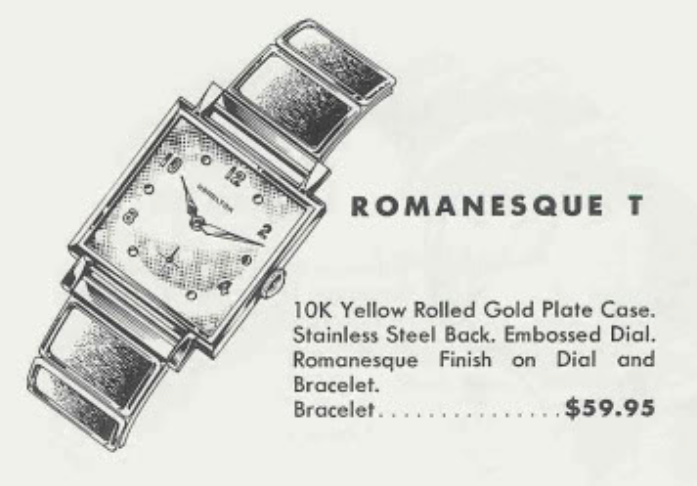 To my amazement, when I consulted the catalogs I realized there is a Romanesque T from 1960 that has the same bracelet! However, the dial has dots at the odd number positions. The Romanesque models were only made for a single year - 1960. The back of my case is engraved with a name. The watch and the bracelet are in excellent overall shape, just a little dirty. 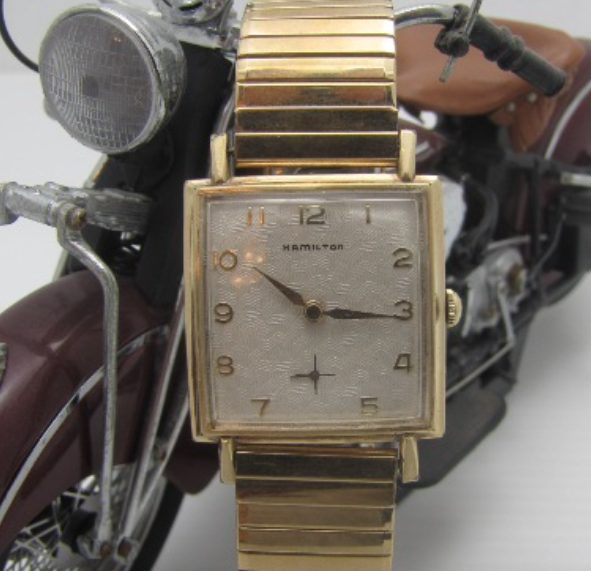 Removing the bracelet reveals a pair of spring bars and they are exactly the style that would have originally been used. Check out this textured dial. This sort of dial is near impossible to get refinished properly as the crispness of the texture is easy to lose. The 17 jewel 673 movement is in good shape but the dull finish is a clear sign it hasn't been to a watchmaker in a long time. Oh, by the way, I didn't mention the movement isn't running, but nothing looks damaged. The back of the dial shows no signs of being refinished. I'm 99.9% sure this is an original dial. Everything is cleaned and dried before reassembly. 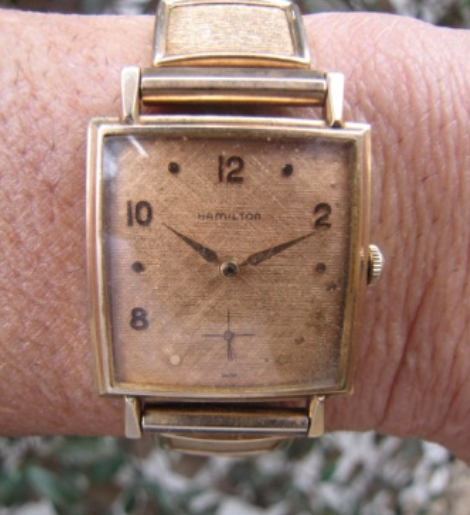 A new crystal will go a long way toward improving the watch's appearance. It's always a relief to see the balance start to move when it's reinstalled. I've reached the point where I can tell by sight if the watch has an obvious issue but only the timer can say for sure. This watch appears to be running great to my eye - so it's off to the timer. Looks pretty good. The amplitude of 224 is lower than I prefer. I like to see amplitudes over 250 but 200 is my lower spec limit. I suspect this watch's amplitude will increase as the freshly cleaned mainspring settles back into place. A quick tweak of the regulator slows the watch down. I bet I'll have to tweak it up a little, as freshly overhauled movements tend to slow a smidgen after they run a while. All cleaned up with a fresh crystal and the bracelet reinstalled... this watch looks almost new. The question now is... what model is it? I happen to have a friend who has both models and here are photos of his watches. What do you think? Dexter or Romanesque T? Someone kept their Dexter too close to their Romanesque T in the watch drawer. Whatever the case, it's a stunning watch.